And then I do an awkward face. I will often also follow it up with a slightly half-baked comment about looking into working from home, but then people ask what sort of thing I'm looking into, and it gets messy, because I keep changing my mind on that and now feel rather anxious about pinning my colours to the mast only to change my mind again in a couple of weeks. I never intended for this to happen. When I went on maternity leave, I fully expected to go back to work when Toddler was 9 months old. Then I was offered voluntary redundancy and, as I wasn't particularly passionate about my job anyway, I took it. The plan was to wait until Toddler was a year then look for work in schools, as I wanted to eventually train as an English teacher. Well, I applied for a job just after Toddler turned one, and the experience of leaving her for just a few hours for the interview made me realise we weren't ready for it yet. I applied for more jobs a few months later but got nowhere. Then came the summer holidays when I couldn't job-hunt anyway, and by the end of the holidays I'd decided that, actually, staying at home was probably the best thing for our family. My first pregnancy was very difficult due to developing SPD at around 30 weeks. By the end of my pregnancy I could barely walk, and even before then, my last few weeks at work were horrendous as I was in constant pain. There is a chance that with the next pregnancy the SPD will come back sooner and worse, and we do want at least one more child, so I don't want to repeat the experience of working through major pain. 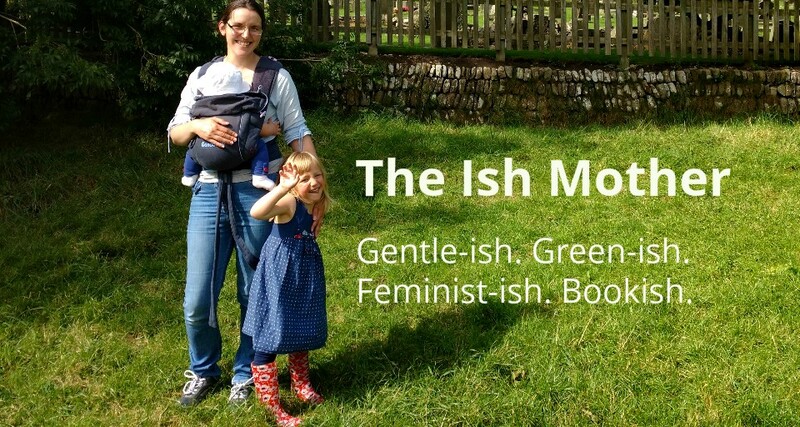 As you've probably gathered if you've read around my blog, some of my ideas about raising Toddler are, umm, shall we say not mainstream?! I honestly don't set out to be 'quirky alternative mum', it just kind of happens because I'll only do things that I feel are right for us, and those things are often, well, not mainstream! So finding a childcare provider who would be sympathetic to our way of doing things was a challenge I just didn't feel like facing, especially as nursery and childminder places in my area are very much in demand so I couldn't be too choosy. We realised that we could afford for me to stay at home, so well, why not? So many mums I speak to say they wish they could stay at home (or wish they could have done when their children were younger) so actually, I'm very lucky! So, with those reasons, why do I still feel the need to pull an awkward face and try to justify my decision? I suppose part of it is me feeling uncomfortable with being lucky enough to do this. I hear my friends talking about how hard it is juggling work and home and I really feel for them, and deeply admire them too! I feel almost embarrassed that things are a bit easier for me, and it makes me feel like I should just keep my mouth shut because I don't want to seem like I'm rubbing it in anyone's face. There is also a sense that by opting for this oh-so-traditional role, I'm letting the sisterhood down a little bit. It's a tricky one. I absolutely believe that men and women should have equal rights, opportunity and pay, and it's difficult to square this belief with my gut instinct that I should be at home with Toddler right now. I also feel a little bit like I'm letting myself down – I'm quite well-educated and showed a lot of promise at school, and yet here I am, jobless. But then I reason with myself that I didn't feel fulfilled career-wise in my previous job anyway, so I'd probably still feel like this even if I had gone to work. I do worry about the message I'm giving Toddler as I want her to know she can be and do anything, but maybe that ought to include just being a mum if that's what she wants? And then there's the issue of perception and reality. I'm sure when people hear I'm a stay-at-home mum they expect me to have a spotless house, do loads of exciting, crafty activities with my daughter, make wonderful elaborate meals and frequently bake cakes. I don't. I'm not a born housewife; I hate housework, I'm a rubbish cook and I don't like to bake if I'm pushed for time, which is always when you have a child. As for the exciting activities, I try to do some but then I just have to clear up, and that's housework, isn't it? (I do keep my house as tidy and clean as possible, honest, but spotless it ain't!) So I'm left with the feeling that, although maybe I am meant to be a stay-at-home mum right now, perhaps I'm not a very good one!! All that said, I do feel blessed to be able to spend so much time with my daughter, to see her growing up, day by day, into an individual. I love that when she's off on one of her weird monologues I can almost always tell what she's on about, even if it means that I often function as a translator! I love that I get to play with her so much, even if it gets a bit repetitive. And I love that maintaining our attachment to each other during these formative years is pretty much effortless, even if it means sacrificing the joys of regular adult company for a while. So yes, I may not feel 100% comfortable in my role, but I am still very happy that I am a stay-at-home mum. Am I weird yet, Dr Christian? Well, well, my social media has been busy today. There has been a lot of talk about comments made by Dr Christian Jessen as part of an article in 'Closer' Magazine about a woman who breastfeeds her 4-year old. According to him, breastfeeding after 6 months, "has no effect," and breastfeeding an older child, "could result in behavioural problems." He later attempted a climb down claiming he was misquoted and was referring to the situation in the article. He sent a tweet saying, "of course breastfeeding beyond 6 months is fine. The story was about breastfeeding a six year old boy." Actually, Dr Christian, it was about breastfeeding a four year old boy, but seeing as you claim breastfeeding beyond 6 months has no benefits I'm guessing you're not very good at paying attention to things, for instance the considerable body of evidence suggesting that breastmilk has benefits way beyond infancy. So I'm rather confused, Dr Christian. At what point does breastfeeding become, "just weird"? My daughter turned two last month. We're still breastfeeding. I remember when she was few months old someone made a comment about continuing to feed her until she was two and I gave the woman a funny look. Two? Yeah, right, pull the other one. And yet here we are. I can't really imagine feeding her at the age of four, or six, or eight, but then two years ago I couldn't imagine her feeding for this long. (Actually, exactly two years ago, it was looking unlikely that we'd last two months, let alone two years, but that's another story!) Every time a milestone came along in her life - 6 months, 1 year, 2 years - I just couldn't see any real reason to stop. Maybe in two years time I'll find myself still feeding her, still not really seeing a reason to stop. But here is a doctor saying at some point this would get weird. So what's the line? Up to 4 years is fine? Or up to and including? Is it on the 5th birthday that weirdness will descend and my confident, sociable daughter will suddenly cling limpet-like to me and refuse contact with all other human beings? Or the 6th birthday? Or when a stranger on Twitter tells me so? The thing is, very few women set out to breastfeed an older child. Lots, however, set out to breastfeed a newborn. Then as the days go by that newborn becomes a regular baby, then a toddler, then a pre-schooler and beyond. And some women (a small proportion in our country but a much bigger proportion in other cultures) will find themselves still breastfeeding. How is that weird? That child will only be a day older than they were yesterday when they still wanted breastmilk, what changed overnight? Or maybe, just maybe, being given the opportunity to make her own choice about when to give up this very important part of her life will show my daughter that I trust her to make big decisions in her own time, and will make her a more secure, confident person. I could be wrong. But at least there's evidence to back up my point of view beyond a single tweet saying it's weird. I fret a lot about screen time, whether that's TV or computer-type devices. We do pretty well at avoiding screens since on the whole - Toddler doesn't play on my phone and very rarely looks at the laptop either. 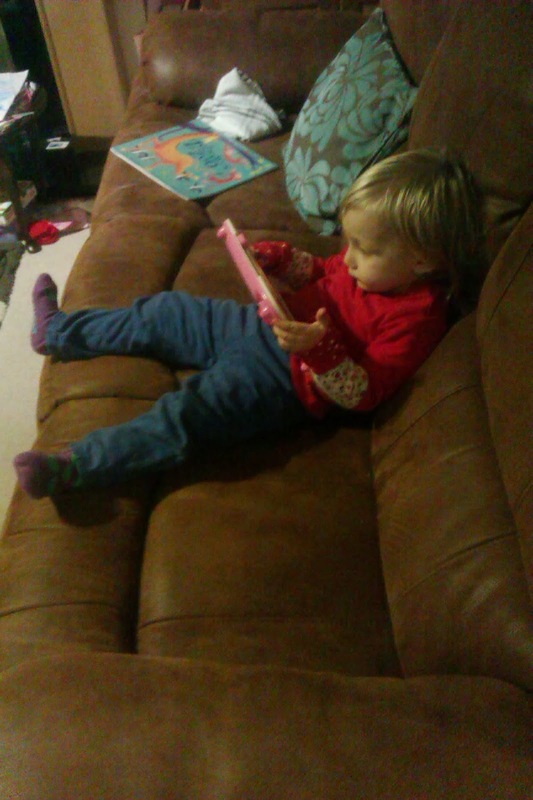 But she watches at least a couple of TV shows a day (albeit 10-minute ones) and she will slouch on the sofa with her toddler-tablet like the world's smallest teenager. So when I heard that Karen over at Let Kids Be Kids was organising a screen-free day for Sunday 19th January, I decided I'd test myself and take the plunge. We planned some activities in for the day to keep Toddler busy, but we knew that the big challenge would be first thing in the morning. Often when we walk downstairs she will say to me, "Watch Raa Raa!" or, "Watch Abadas!" (Those are pretty much the only TV programmes she watches. She can pretty much recite whole episodes of 'Raa Raa the Noisy Lion', she's watched them so many times) Usually we relent and let her watch a couple of episodes before breakfast, and maybe one or two afterwards, so I was quite anxious about how to distract her from these demands. In the end, it wasn't that bad - she just wanted to look at books at first, and it wasn't until about 8.30am that she realised that she hadn't watched any TV and had the long-expected meltdown about it. 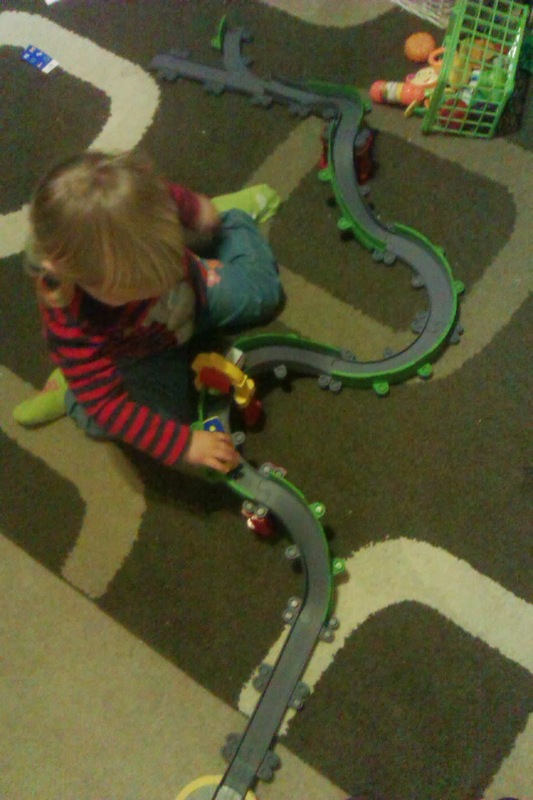 I offered her a few alternatives and she decided to play with her train set, which she did very happily. Crisis averted. We then went to the farmer's market in our town. After the success of our walk a few days before I decided to walk there with Toddler, and my husband met us there with the car. In the end we probably spent three times as long getting to the market as we did actually there! It had been dry when we set out but started to drizzle and then properly rain, so we didn't hang around for long, but it was good to see how far Toddler could walk without the incentive of puddles! Then came nap time and an unexpected challenge - what do I do now??! I'm terrible for faffing about on the internet and most days I waste nap time playing online. If I don't do that, I'll often catch up on TV instead. Deprived of these options, I ended up cleaning our kitchen more thoroughly than I have done in ages, and then I settled down to do some knitting. Once Toddler was up and fed, we played with trains and read books until it was time to go to our next activity - Messy Church. If you're of a churchy persuasion and have small children, I thoroughly recommend Messy Church. The format varies from place to place, but at our local church it consists of about an hour of doing different craft activities (you can pick and choose which activities you do and in what order) followed by a short 'service' (basically a bit of singing and dancing followed by a story or a child-friendly talk) then topped off with a shared meal. 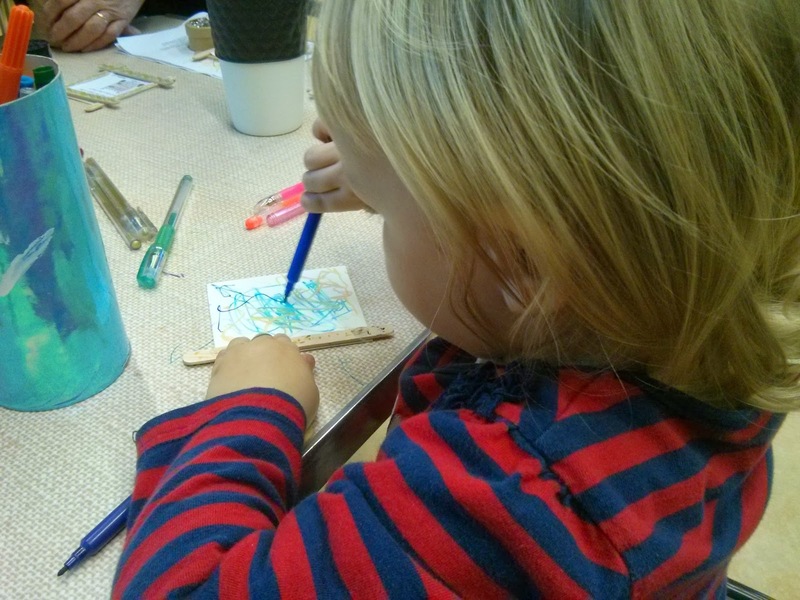 It's a fantastic chance to try different crafts out with your kids and there's something for all ages - yesterday Toddler played with playdough, did some colouring in, decorated a little jewellery box and sabotaged what could have been a very nice little picture frame. We only did about half of the activities because Toddler preferred to just wander around, and was keen to get into the church sanctuary for the singing and dancing - and in her case, climbing under the communion rail repeatedly. Fortunately the minister didn't seem fazed by this! We went home, played and read some more, then Toddler went off to bed, falling asleep much more quickly than normal. 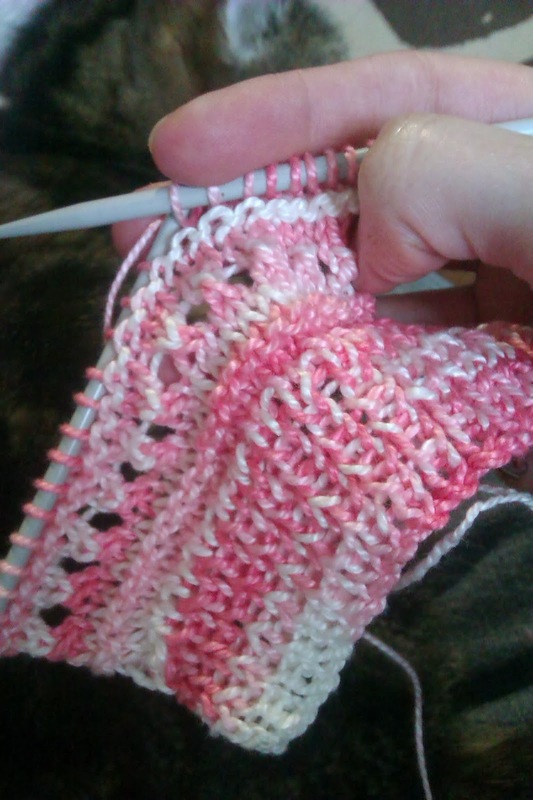 Again bereft of TV and laptop, I did some more knitting before having the one thing all parents need the most after a busy day - an early night! It surprised me how easy it had been to keep Toddler away from screens all day. It helped that it was a weekend so I had my husband to help; often I use TV as a distraction while I go and get dressed or get the laundry on, so having someone else to entertain her was useful. But other than that, it really wasn't hard. The harder thing was keeping myself away from the laptop! But it meant that I achieved more and had some proper downtime instead of staring at a screen. In the end, we didn't need to do anything particularly exciting or elaborate to get through a day without screens, which just proves that anyone can do it! You don't have to travel anywhere, or spend lots of money - long walks, local events and favourite toys are really all you need! Not far from our house is an unadopted road leading onto a bridleway, and it has some epic potholes so is a great place to take Toddler for a good splash. It never ceases to amuse and amaze me how she will happily plough into an enormous puddle, while I'm cautiously stepping around it, trying my best not to put a foot in it despite wearing wellies! When we've gone puddle hunting before we've not ventured too far up the road, but this time she was insistent on hunting out more puddles and we walked further than ever before, and went back and forth along the road and bridleway twice to get maximum enjoyment from the puddles! We're lucky enough to live in a small, former industrial town on the outskirts of Leeds and it often feels like the meeting of two worlds. This morning, walking along the bridleway halfway up a hill, it struck me how I could look one way and see nothing but fields and trees, but if I turned my head the other way I could look down the hill and see a shiny new housing estate, with houses packed close together. In one ear was the sound of birds, in the other I could hear sounds from the nearby mill and factories. It's amazing how you can feel like you're in the countryside so close to the bustle of the town. I really need to take more advantage of this, so that Toddler will keep her love of the great outdoors. It's a while since I'd taken Toddler for a proper walk, due to illness, injury, wet weather and the simple fact that I'm not keen on being cold. But I was surprised at how far she could walk, how sensible she was about crossing roads, and how much energy she had. Last time we did this walk we didn't go as far and I had to carry her the last few yards. This time she could happily have walked for much longer had I not been so conscious of the need to get back for her nap! I guess it's just my brain adjusting, as it will have to do continually, to the fact that my daughter is becoming ever more capable, more energetic and stronger. She will surprise me more and more as she grows. It seems bizarre to think that this is the same girl who, this time last year, couldn't walk. I wonder how far we'll be walking on our puddle hunts next year?! Books for boys, books for girls: how innate is this? When Toddler was born, I was halfway through an Open University course on Children's Literature. As part of this course, I studied the rise of gender segregation in children's books from the eighteenth century onwards, and an interesting point kept popping up: while girls would (and still will) read books intended for both girls and boys, boys would only read books intended for boys. Put bluntly, girls see boys' books as providing action and adventure that girls' books tend not to contain, but boys see girls' books as a load of sentimental, pink mush. But how innate is this divide? Over the past two years, I have read A LOT of books aimed at babies and toddlers (largely thanks to our wonderful local library) and I've noticed a worrying trend. Even in books aimed at very tiny people, gender divisions creep in. For instance, Toddler has a book called That's Not My Fairy in which all the fairies are female - because boys aren't supposed to identify with fairies, right? Ladybird's similar offering, This Little Angel fares better with one angel out of five being male, but conversely another book from the series, This Little Footballer has four boys and only one girl. Considering the rise of popularity of football with girls, this is surprising to say the least. Here, the inclusion of a token girl seems to say, "well, some girls play football, but it's not really normal, now is it?" Have a think about some of the picturebooks you've read and you'll notice a creeping inequality. Much as I adore The Gruffalo, where are the female characters? (Thank goodness for The Gruffalo's Child which ever so slightly redresses the balance!) How often do you see a book where the main character is female, or where the gender balance is equal, let alone girl-heavy? Perhaps this is one of the reasons why girls read boys' books but not vice versa - girls are so under-represented in books aimed at the very young that girls just get used to reading about boys, but boys don't get used to reading about girls. So what to do? I'm certainly not going to refuse to read Toddler anythingawith any less than 50% female representation, because the pool would be so small I wouldn't be able to satisfy her seemingly limitless appetite for reading! Instead I try to slip in comments to even up the scales, or subvert the text a bit - for instance, I might have changed the gender of one of the footballers in the aforementioned book. But the day will come when she can read and will notice things like that, and what to do then? Well, hopefully by then I'll have found a decent collection of books which show girls as more than fairies and princesses. And here's where you come in - what books for little ones have you found that give a good representation of girls, or simply that have equal male and female characters? The more we share our knowledge, the more we can raise the profile of these books and give a message that we want more of the same!